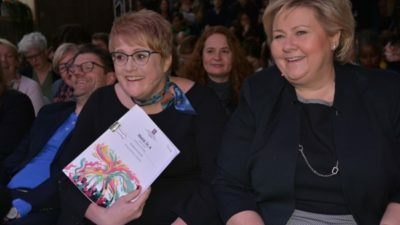 Norway’s government minister in charge of culture, Trine Skei Grande, said she felt like it was her birthday, Christmas and the 17th of May (Norway’s national day) all at once: For the first time in 15 years, she’d be presenting the framework for national cultural policy for the future, and set off debate at the same time. Given the recent regional reform in Norway that’s merging counties and making them much larger, Grande expects them to take on more responsibility for culture and their share of financing. More details of that will come later. The report lists nine overall goals: to create art and cultural impressions “of highest quality,” to promote education and critical reflection, to take care of and promote Norway’s cultural heritage, to create and promote cultural offerings that represent the public, that art and culture be available for all, to offer gathering places for artists, to renew and restructure cultural institutions when needed, to promote cultural understanding internationally and to strengthen the Norwegian language, the Sami language, national minority languages and Norwegian sign language as a foundation for culture. Grande noted on Norwegian Broadcasting (NRK) that the Norwegian language and culture can feel threatened by globalization, but she urged Norwegians to see globalization as an opportunity, and a means of exporting Norwegian culture. “Our culture policy must actively contribute towards everyone feeling they have equal opportunities to express themselves, and to experience art and culture of the highest quality,” Grande said. Her main goal was to define culture’s role in society, which she believes is of the utmost importance. Concrete plans and projects will come later.